I’m going to Paris!! My husband and I booked our flight last weekend. Needless to say, I’m super excited. For me, planning a vacation is half the fun. What will we do? What will I wear? I could really use your help with my preparations. 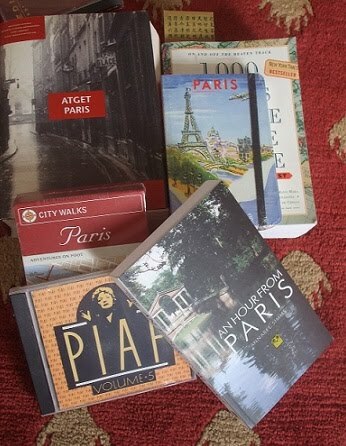 So…for my February Giveaway, I’d like to know: What Would You Pack for Paris? Whether you’ve gone to Paris or just dreamed of going to Paris (like me), I’d like to know what you would pack. Share your ideas in the comment box on this post for a chance to win one of three $25 Amazon.com Gift Certificate! See all the details below. What Would You Pack for Paris? Do you have a favorite walking shoe? How many pairs of shoes would you take? Do you have a favorite outfit that works for day or night? What’s your favorite outerwear for travel? Do you have a packing philosophy when traveling in Europe? I could really use your advice! For a chance to win one of three $25 Amazon.com Gift Certificate I'm giving away, you must leave a Comment on this post. Please note: I will be sending a $25 Amazon.com e-gift certificate to each winner via email. I will use the email address (which never gets published) you’ve used to leave your comment. So that email address must be valid. Please include your age (or decade—i.e., over 50 or over 60). This Giveaway is open to all Flattering50 readers. To enter for a chance to win, your comment must be posted no later than Sunday, March 11, 2012, 11:59 PM EST. The winner will be selected by a random drawing and contacted by email on March 12, 2012. Winners will receive an email from me, asking them to confirm that their email addresses are active. Once a winner has confirmed that her email is valid, I will send the Amazon.com e-gift certificate to that email address. If I don’t get email confirmation for a winner, a replacement winner will be chosen. So please…check your email on March 12th and confirm your email address right away.